Fresh theme here: We’ve got the SKY and SEA both clued as [Blue expanse] in the centers of the top and bottom rows, beside a thing found there—PLANE and CORAL. The long themers are collective groups of animals that move through SKY and SEA: a FLOCK OF BIRDS (oh, how I wish this were FLOCK OF SEAGULLS! Damn you, SEA, for being part of the theme and crushing my ’80s New Wave dreams) and a SCHOOL OF FISH. The center of the grid is the HORIZON between the sea and the sky, complete with black squares blocking off the rest of the row for a solid horizon effect. I love an Angela Davis reference, but seldom like a FRO or AFRO clue that clings to the ’60s and ’70s for its reference (here, it’s [1960s Angela Davis do, informally]). I am not an expert on terminology for natural hairstyles for black hair, but I’m thinking Davis’s hair at a speech just two weeks ago (which is 2016, by the way) is quite a bit on the FRO side. Kind of a loose Afro there. 59d. [Bother for Bowser] clues FLEA here. I have never heard of an actual dog named Bowser (it doesn’t make this recent top-100-male-dog-names list. My go-to Bowser is the guy from the ’70s retro-’50s band Sha Na Na. Hey, I suppose fleas would bother him too, if they bit him. I do not know anything about his exposure to animals, though. I am getting faster on the Jonesin’ puzzles! Are we rounding into Stamford form? On a serious note, though, Matt, from his surely snow-less climate in the Pacific Northwest, takes a low blow at the suffering Northeast, where a lot of people just got blitzed by a brutal couple of feet of snow! There is no snow where I am, either, and here in northern Indiana we usually get our fair share, so I don’t have much sympathy for the east coast! As a matter of fact, here on Tuesday it is supposed to be over 50 degrees! Not bad for February! I enjoyed the theme. But, admittedly, I am not frazzled and temporarily insane from inclement weather this year! So perhaps I am more able to find some humor in a “snow joke!” Two years ago, this puzzle would have literally made me angry! 41A [Grammy-nominated Macy Gray song of 2000] I TRY – This song is in puzzles a lot, but I don’t remember that it was actually nominated for a Grammy. 67A [First Great Lake, alphabetically] ERIE – Also the only one with four letters!! 5D [Lego person or character, slangily] MINIFIG – As in miniature figurine? New term to me. 25D [Do a Google search on yourself, e.g.] EGO SURF – It feels like the “e.g.” is unnecessary in this instance; isn’t Googling yourself the very definition of ego-surfing? Favorite entry in the grid! 43D [Edible mushroom of Japan] ENOKI – Sounds like a good ingredient on Chopped! A fun puzzle, Matt! A little mean, but fun! 3.9 stars. 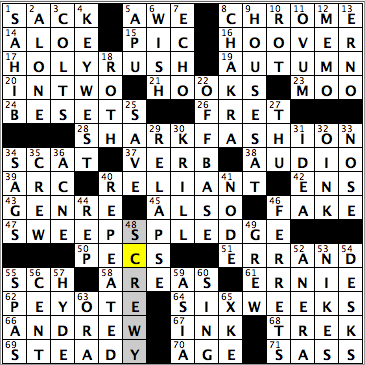 And, sure enough, each of the first four theme entries have the letters C, O, and P in circles. A cute theme. The letters COP were evident early, so you progress in solving wondering how the word “cop” is going to be explained at the end. A pleasurable way to tackle a puzzle. It also adds to the joy that it isn’t too difficult! 14A [Winans of gospel] CECE – A good singer, but from a family of singers, so there are a couple of Winans this could have been! 28D [Raising money for a children’s hospital, say] NOBLE CAUSE – Nicely done. A great couple of long answers crossing a couple of theme entries each. 49D [Xbox One rival] WII U – I don’t know anyone that has one of these. A fine Tuesday entry. 3.8 stars today. 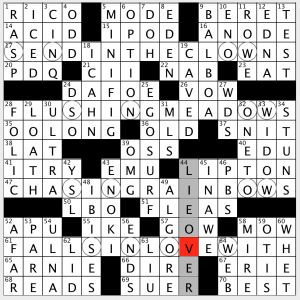 Well, today’s puzz was one real smile-maker for this solver—starting with the title, which is a word that the OED added to its volumes just last summer. And how does Liz put it to thematic use? 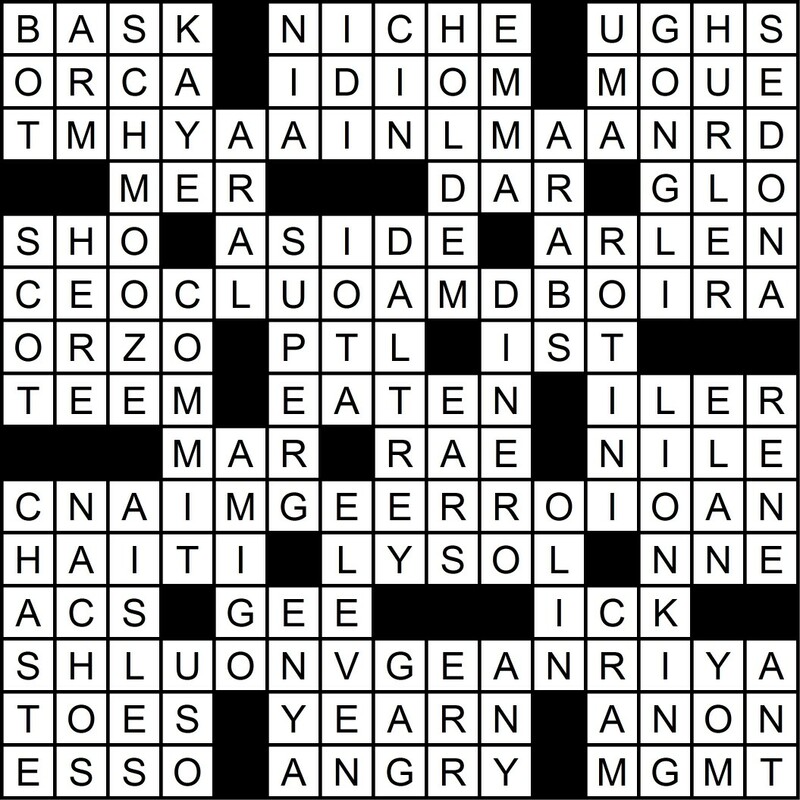 The first word (or two words, in one case) of each of the five grid-spanning themers also names a kind of sauce. A well-wrought theme that can be savored by foodies and word-nerds alike? Awesome! 16A. [They might be found under screwdrivers] COCKTAIL NAPKINS. So we’re talkin’ about alcoholic beverages and not TOOLBOX HARDWARE. Also, COCKTAIL sauce is a condiment for seafood. How did a sauce for seafood become associated with COCKTAILs? Read on! 22A. [One time priority mail service] SPECIAL DELIVERY. A postal service option from 1885 to 1997. R.I.P. SPECIAL sauce? A thousand-island-dressing-like component of the Big Mac and still goin’ strong. Now bottled and for sale (in Australia…). 35A. [Cash that’s not easy to come by] HARD-EARNED MONEY. How true. But any cash you’ve worked hard for is probably cash you’ll value highly and be less likely to squander. Which I take as a good thing. HARD sauce? Easy to take—laced with rum, sherry, whisky or brandy, this sweet topping has a consistency that’s more like a spread (than a runny sauce…) and ever so tasty on desserts! 45A. [Ice cream parlor orders] HOT FUDGE SUNDAES. Serious yum—but also the only themer that produces a serious “umm…” Why? Because the type of sauce is inseparable from the phrase as a whole. HOT FUDGE SUNDAES are named for using HOT FUDGE sauce. So this particular themer (sweet as it is on so many levels) feels like the outlier nonetheless. 55A. [Thin things on a prom dress] SPAGHETTI STRAPS. See how much cleaner this example is? SPAGHETTI sauce and SPAGHETTI STRAPS are two entirely different entities. More better [sic]! In addition to this lively theme set (with its savory and sweet sub-set), we get a good bit of strong, longer fill—more than we’ve seen in the past few weeks. And, we don’t get the undue reliance on proper names we’ve seen of late either. All of which says that theme density doesn’t necessarily preclude the ability to produce an interesting, well-filled grid. So, thank you: ORCHESTRA [Pit ensemble], ORANGUTAN, TENNESSEE (River) and INDIANANS [Hoosiers]. 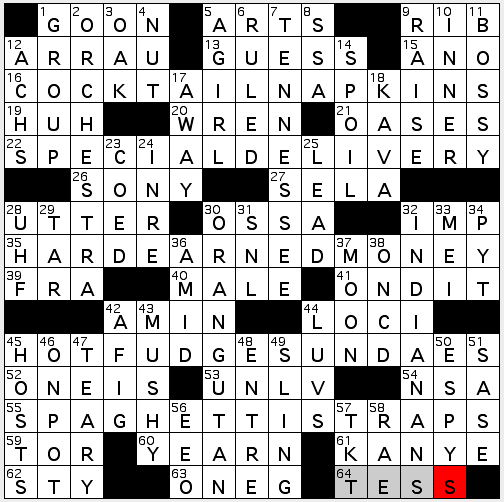 Yes—three of those longies are proper nouns (and there are more in puzz—my faves being the symmetrically place, diametrically opposed classical musician Claudio ARRAU and pop star KANYE West), but their length gives them some real weight, and the grid as a whole does not feel overrun with names (they’re not concentrated in any one area of the grid today). Emotion-evoking fill like TEARY [Inclined to weep] and YEARN [Pine (for)], MUSHY [Mawkish] and the attitude-evoking BOSSY [Always placing orders?] keep things lively, too. Enjoyed the potential link I saw between [Lived like a king?] and RULED, and (like some kings…) [Always placing orders?] and BOSSY. Though someone who gives a lot of orders isn’t de facto a BOSSY person. Style does come into play here! [Party bosses?] are not POLS today, but HOSTS—who may have facilitated RSVPs by include an SASE in each (snail mail!) invite (though I’m not sure I’d be particularly happy at a party with a BOSSY HOST…). While I’m not a fan of partials, I do like the way two of these come together today: [“Something tells ME I goofed!”]. Ah, well. [“No ONE IS to blame”]. Whew. That’s a relief! And on that high note, I’m gonna high-tail it. Thanks for reading, keep on solving, and I’ll meet ya back here next week! We have a new byline today. I haven’t seen the name Maxine Cantor in any of the databases, so this may be a debut or yet another Mike Shenk pseudonym. If the latter, possible anagrams are: Macaroni Next, A Mexican Torn, and Inexact Roman. Anyhoo, on to the puzzle. Keystone Staters, this one’s for you. I was trying to figure out why this puzzle would run today when it’s just a simple list. It might have been more fitting if it was switched with yesterday’s. But then I realized that today is in fact GROUNDHOG DAY. I was impressed that all these films were/are really big hits and that they all fit symmetrically, but was less impressed that three of the four are set in Philly and only one is set elsewhere (Punxsutawney). There are of course other films set in Philly, they just might not fit symmetrically. So, kind of a strange puzzle in that three of the four are set in Philly, but it’s the one outlier that seems to be the impetus for the puzzle…or at least the reason it was chosen to run on this day. Of these films, it seems that only GROUNDHOG DAY enjoys cult-like status, i.e. that people will happily watch it over and over again. In fact, over here in the UK, Sky TV is airing the film back to back to back 13 times in a row (if you follow the link, be sure to scroll down for the joke). But back to the puzzle. It’s solid all over, as we’re USED TO from editor Mike Shenk. Good fill includes GEMINI, STOLLENS, SAYONARA, and WEDDINGS. It’s interesting that the two outer themers are offset from the grid’s edge. This results in a number of “cheater” squares on the edges, but may have been necessary to get the letter patterns to cooperate. The grid is fairly proper name heavy, especially in that small North section where ELIOT, MAGOO, ALAN, RIGG, and BOOP are clumped together (that’s 5 out of 8 words in that section alone). There’s also ANDRE, LIU, DAHL, DALEY, DAVE, and NORAH. Plus, the proper names in all the clues. If you have a thing about proper names in your puzzle, best skip this one. So overall, I have mixed feelings on this one. It’s a fine, well-made grid, but the theme feels a little off. It seems like it wants to be about Pennsylvania in general and GROUNDHOG DAY in particular (especially given what day it is), but three of the themers are focused on Philly. 17-A [New country formed by the merger of two bordering Asian countries?] = TmHyAaInLmAaNrD, or THAILAND alternating letters with neighboring MYANMAR (a.k.a. Burma). 31-A [New country formed by the merger of two bordering South American countries?] 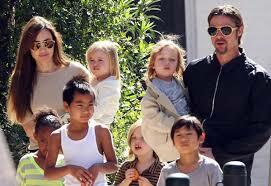 = CeOcLuOaMdBoIrA, or COLOMBIA mixed in with next-door ECUADOR. 48-A [New country formed by the merger of two bordering African countries?] = CnAiMgEeRrOiOaN, or CAMEROON with NIGERIA. 61-A [New country formed by the merger of two bordering European countries?] = ShLuOnVgEaNrIyA, or SLOVENIA and HUNGARY. I’ve spent more time (3 months) in Hungary than in any other foreign country, and did not know until solving this that it shared a border with Slovenia. I have also lived in Virginia for 8 years and only recently learned that she shares a border with Kentucky. Anyway, I dig geography in general but this solve was rather joyless. The four long entries are just gobbledygook with no real payoff since figuring out the intertwining gimmick didn’t provide much of a “Eureka!” moment. On the plus side, the four neighboring pairs were from four different continents, so we got a true trip around the world from it. DALTREY, SCHMOOZE, LION KING, HOLD ‘EM, SUPER G. and partnerless HAITI were all good. 55-D clue might be an error: [GA-IN dir.] is NNE, but on my map it looks like NNW. Good day, everybody! 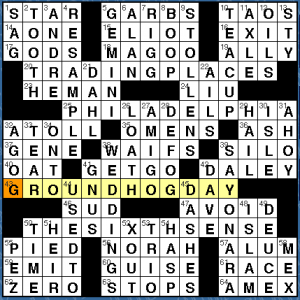 Now that we’ve gotten the silliness with the Keystone State groundhog that gets so much attention, it’s time to turn our attention to crosswords – with a Groundhog Day twist – like the one on offer by Mr. Todd McClary. Very clever grid, as each of the themes are puns, with the answers being two-word entries in which each word in the entries is a specific type of week. All together, there are six words involved, and SIX WEEKS appears in the grid as the reveal (64A: [Possible groundhog-predicted extension of winter, and what 17-, 28-, and 47-Across represent]). SHARK FASHION (28A: [Runaway apparel modeled by swimming predators?]) – Oh, and it happens that Fashion Week is almost upon us here in New York. Maybe we’ll see someone dressed as a shark walk down a runway? Love the Indian touch in the top part of the grid, with CHAKRA (8D: [Yogic energy point in the body]) to go along with SAHIB at the beginning (1D: [“Sir,” in colonial India]). Love to clue to PEYOTE, and seeing it reminded me of my old drugs and human behavior class in college and the professor who let all of us know his experiences with the drug, and other drugs (62A: [Cactus used for vision quests]). If I ever thought about what it was like to be around Timothy Leary back in the day, that probably would be my closest experience to that. So it seems like most of the Northeast is currently experiencing weather that’s almost has to be described as KEY WEST-like, especially given that we should be close to freezing at this time of year (4D: [Florida resort]). 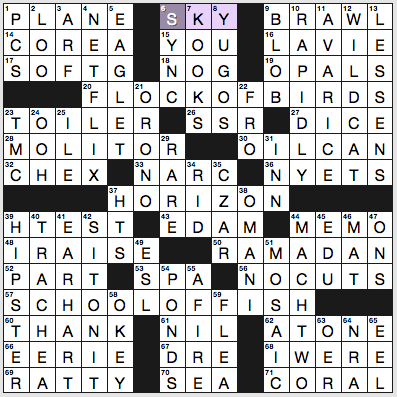 Not too much junk and crosswordese in this grid, and definitely enjoyable, even if it was a brisk experience solving. “Sports will make you smarter” moment of the day: COLTS (3D: [They have horseshoes on their helmets]) –It’s Super Bowl week, so definitely have to talk about something related to the big game. Probably the worst Super Bowl in terms of aesthetics was Super Bowl V, when the Baltimore COLTS, despite committing seven turnovers, defeated the Dallas Cowboys, 16-13. The game was decided on a last-second 32-yard field goal by Jim O’Brien with five seconds remaining. This game remains the only Super Bowl in which a player on the losing team won Super Bowl MVP, as Cowboys linebacker Chuck Howley won the award after recording two interceptions in the contest. This entry was posted in Daily Puzzles and tagged C.C. Burnikel, Elizabeth C. Gorski, Matt Jones, Maxine Cantor, Patrick Blindauer, Peter A. Collins, Todd McClary. Bookmark the permalink. I usually love the Blindauer puzzles, but I’m afraid this one was a rare exception. While the technique emerged pretty quickly, finishing the puzzle wasn’t much fun. I look forward to a return to Patrick’s usual excellence in future months. Two stars from me. 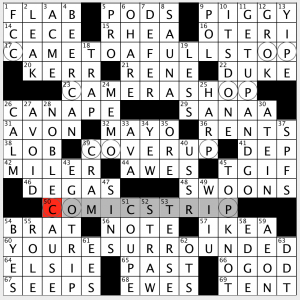 @xword nation: the themer HOT FUDGE SUNDAES is probably intended to contain HOT sauce, a more canonical term than HOT FUDGE sauce, I think (and also, of course, less intrinsically-tied to the entry itself). great point, jean — and i suspect you’re right, so thx for speaking up! still, i find the potential for ambiguity/the food-on-a-food component problematic, muddying the entry. that said: always good to have one’s eyes opened to other understandings. maybe this is what we’d call an “oho” moment! About NYT “fresh theme,” as Amy said, I am totally amazed at this and other constructors’ imaginations. Thank you for this very unusual and fully realized effort. 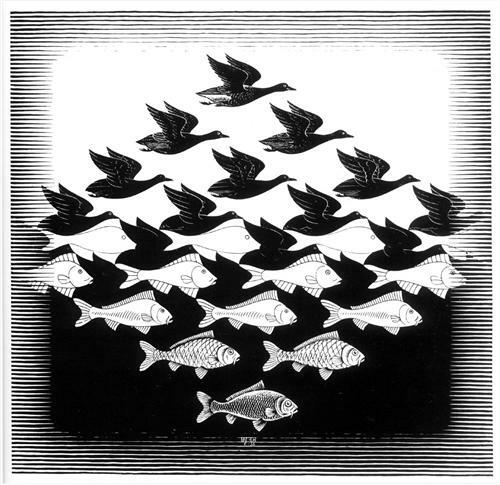 NYT: I can’t help but think that the puzzle was inspired, and meant to evoke, MC Escher’s Sky and Water tessellations. CORAL and the non-geometric PLANE seem like afterthoughts. Conversely, MOSAIC is in there. NYT: I agree with Amy, the theme felt fresh. I gave it extra points for being evocative. It made me think of being at the beach, looking out on the horizon and being aware of the layering and of nature. I don’t love the PLANE, it ruins the mood. But the rest of the elements of the puzzle felt peaceful, pretty. Maybe I have the winter doldrums and need a beach getaway… I believe Peter lives in my town and may be feeling the same, or he constructed this in the middle of the summer, hanging out on a beach somewhere on the lovely shores of Michigan. I had cloud forever at 1a. I think it fits your picture Huda. I liked the puzzle. NYT (still): I wonder how much of a regional idiom NO CUTS is, which does not sound at all natural to me. “No cutting” is the only spoken reproof familiar to me, even from school days. Or perhaps an incredulous “excuse me? !” Otherwise, it’s scowling, glaring, or, yes, physical intervention. NO CUTS feels eminently familiar to me. So does “no cutting.” “Do you want cuts?” “I’m not giving you cuts.” Plural “cuts” works in Chicagoland. I had the same reaction — NO CUTS isn’t in my vocabulary. It would have been ‘no cutting in’ when I was at school. Whoops! Looks like I was directionally challenged on that clue, Matt. Will make it [GA-ME dir.] when I get home. Fixed, and no trees had to die.